This collection of Civil War-illustrated envelopes provides a window into the politics and culture of a society at war. Most of the illustrated envelopes reflect the attitudes of the Union since the North printed the majority of envelopes. Archivists have selected images for this gallery from a collection of about 1,110 envelopes, representing a wide range of different viewpoints and various styles. This gallery is part of the Wisconsin Historical Society's commemoration of the 150th anniversary of the Civil War. Beginning in the mid-1850s, as differences between the North and South over slavery and states' rights escalated, stationers, printers and publishers began to produce patriotic envelopes for sale. At first, the motifs were mainly flags, with and without verses. As the threat of the secession of the Confederate states drew nearer, tensions escalated and the designs became more diverse, with the majority of envelopes supporting the Union. Nearly all of the major cities produced the envelopes, with the largest producers being Charles Magnus of New York and James Magee of Philadelphia. People could purchase the envelopes by mail, directly from the printer or at booksellers, newsstands and stationers. At first created for use in the mail, some later designs covered the entire envelope and were strictly for collectors. In 1861, as collecting the illustrated envelopes became more popular, some northern firms took advantage by printing envelopes with Confederate themes. Others printed versions that promoted the hobby of collecting the envelopes, and several created specialized albums just for that purpose. Printing of the envelopes ceased prior to the end of the conflict, however, because it became too expensive to continue during a time of war. Out of an estimated 6,000 different envelope designs, only 400 were Confederate. The designs portray a range of attitudes from solemn and patriotic to satiric and racist. Union themes ranged from flags, cannons, globes, shields, Lady Liberty, the American eagle, soldiers, regiments, officers, military heroes and politicians to political cartoons and caricatures supporting the Union, condemning slavery and denigrating the Confederacy. 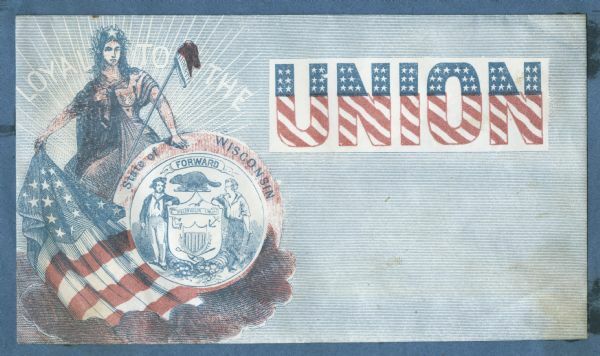 A dominant theme is the preservation of the Union, with the phrase, "the Union must and shall be preserved" appearing on many envelopes. Confederate themes included portraits of Jefferson Davis, General Beauregard, soldiers, anti-Union caricatures, state flags and seals, and most often, the Confederate flag. Many envelopes from both sides contained verses. Printers produced the envelope designs using a wide range of processes ranging from crude woodcuts, letterpress and lithography to fine recess-plate printing, also known as line-engraving or intaglio. Some printers embossed their envelopes; others printed them in color through color presswork as well as by hand painting and stenciling. Viewers of this gallery can appreciate both the beauty of the designs as well as the insight they offer into the popular attitudes of the time. These include the roles of men and women, attitudes towards African Americans, slavery and popular beliefs about the rule of law, the Constitution and religion. They also provide a window into the politics and culture of a society at war. The original Civil War-illustrated envelopes reside in two separate collections: in a pair of scrapbook albums and in a collection of loose envelopes. The collection comprises approximately 1,100 envelopes, 15 percent of which appear online.